"Sometimes the questions are complicated and the answers are simple." 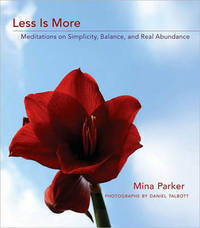 --Dr. Seuss Less Is More is a glorious celebration -- in words and images -- of simple and profound answers. But, is there any way to live the good life in an environment of scarcity? Parker answers with an unequivocal, "Yes." She writes, "We can embrace simplicity as a desired outcome rather than a hardship we can't control. We can throw ourselves into new creation and transform our circumstances into new opportunities by embracing a credo of recycling and renewal. Most of all, we can give back and move forward through a daily practice of gratitude and the intense joy it brings us." * More than 50 beautiful photos, combined with inspiring and comforting thoughts. Mina Parker is a freelance writer, editor, and mom. Her other books include Half Full (2006), Mother Is a Verb (2007), and 100 Good Wishes for Baby. She has also worked as an actor, a grant writer, and an administrator for several nonpro? ts. She lives in Brooklyn with her husband and son. Daniel Talbott is an actor, the Artistic Director of Rising Phoenix Rep Theatre, an award-winning playwright, and a photographer. He lives in Brooklyn with his wife and son.